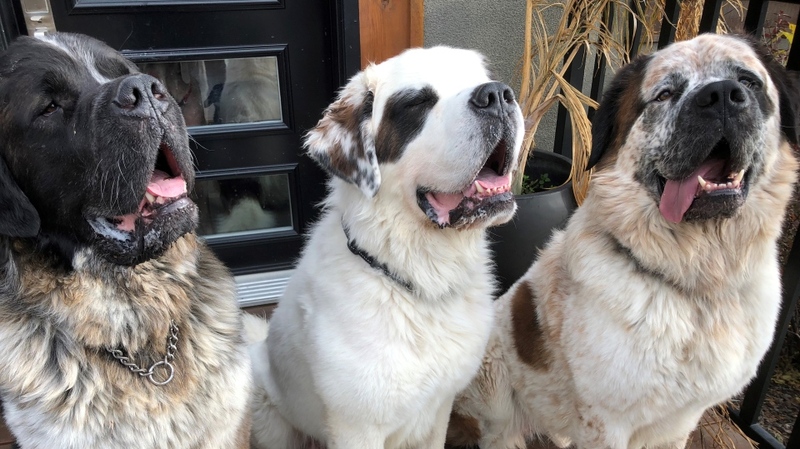 After a week-long process that saw people from around the world apply to adopt them, a trio of Saint Bernard dogs has found their forever home. Gasket, Gunther and Goliath were officially adopted by their new owners on Wednesday and have begun to settle into their new home, according to the Edmonton Humane Society. The EHS says that the family, who want to remain anonymous while the dogs adjust to their new surroundings, made a “perfect fit” for the dogs. The couple is a strong proponent of animal adoption, having adopted several pets in the past. The family includes two older children, and they have a house with a one-acre fenced-in yard. The couple says they found out about the dogs on the local news, and raced to put their names in for consideration. The dogs, which gained substantial international attention, were up for adoption under the unique condition that they had to remain together, after an EHS assessment determined they were bonded, and experience significant stress and anxiety when separated. At a combined 350 pounds, and needing almost $300 worth of food a month, the dogs presented a “giant adoption challenge” for the EHS. People around the world fell in love with the dogs after reading their story, with an almost overwhelming response. “The response to the story of these gentle giants, from the thousands who helped share our call for help to those who offered their homes to these dogs, was truly astounding,” Jamey Blair, EHS’s manager of animal health and protection, said in a press release. Gasket, Gunter and Goliath went up for adoption on Oct. 10, with the EHS deciding to close applications after receiving more than 200 inquiries from around the world in the first day. The following week was spent organizing in-person and phone interviews, to narrow down the number of potential adopters to meet the dogs. The agency says that it prioritized applications in Alberta, to minimize the stress of relocating on the dogs – a decision that was complicated by animal control by-laws in Alberta. Many cities and towns in the province set a limit on the number of dogs that can live in a household to three or four. Calgary, where the dogs’ new owners live, has no such limits. The EHS is hoping that the dogs’ story will bring attention to the thousands of other homeless pets who are still in need of a permanent home. The agency is running an adoption event from Wednesday until Oct. 21, with reduced adoption fees for all animals. 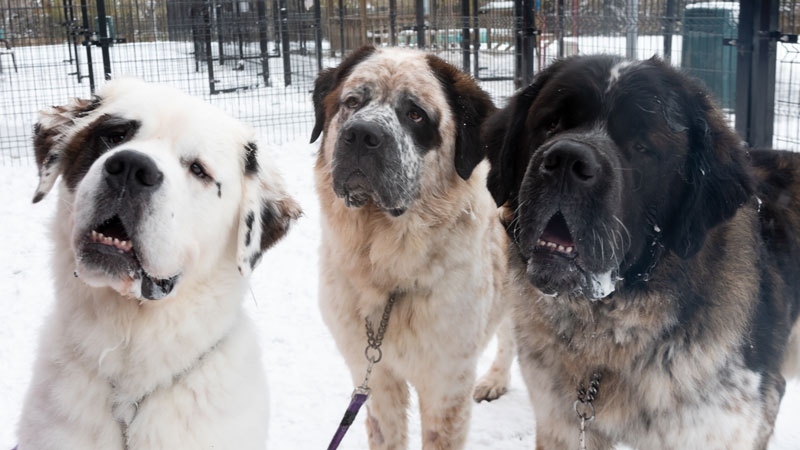 Edmonton Humane Society is looking for a home for a trio of Saint Bernard brothers, Goliath, Gunther and Gasket. Submitted.